This is a women’s short jacket that features an elliptical hemline that is considerably longer in back than in front. It is presented in your choice of tan or blue. The jacket has retro-styled lapels and an easy-open front. 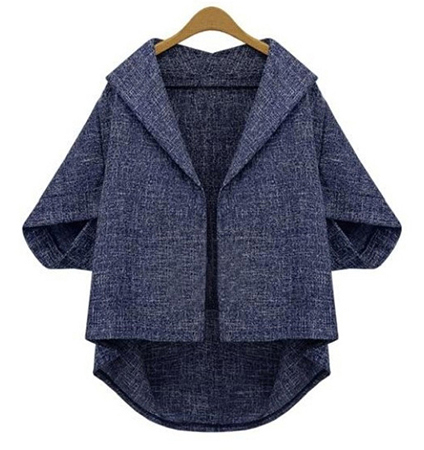 This jacket was intended to be worn loose and open over another garment. Therefore, it has no buttons or zippers. The sleeves are three quarter length and full, ending at the elbows. We recommend dry cleaning only for this garment. It is available for purchase in sizes Small, Medium, Large and Extra Large.